You can enter your equipment information into Planned Maintenance to be able to track costs and history of work done to specific pieces of equipment. Entering equipment in the system is NOT required to begin creating PM Schedules. Many clients prefer to start out by creating non-asset based PMs. Dude Solutions highly recommends starting with non-asset PMs, such as inspections, when creating new schedules for your account. If you do choose to do asset-based pm work, prioritize which assets you want to include (most expensive, critical to operations, etc.) You can add equipment information little by little as you go along. You can also add equipment to existing schedules at a later time. Click on the Equipment link in the Information Analysis section of the home page. Click the + Add New Equipment link at the top right of the equipment list. The Item Number is the only required field on the Equipment form. *Note: The item number should be descriptive enough that it tells you what the piece of equipment is and where it is located (Ex: Boiler_001_Admin). Consistency in your naming convention will help you locate equipment more easily in the future. There are many other fields available to enter as much information about the equipment as needed. 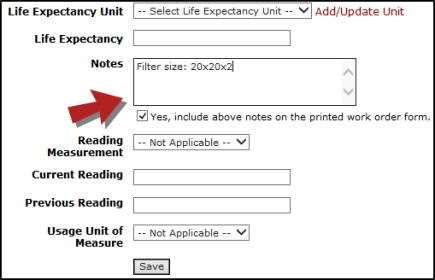 The Notes field can be very useful for information like filter and belt sizes. When you check the box below the field, this information will print on the work order form when you attach this piece of equipment to the PM Schedule. Click Save at the bottom of the form to save the equipment in the system. 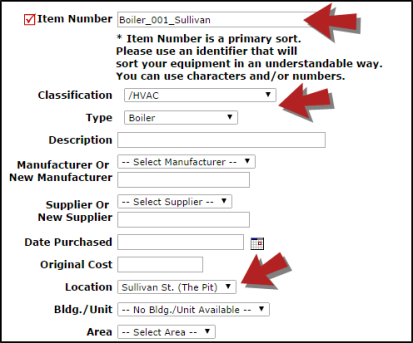 When entering equipment, it is important to include the Classification, Type, Manufacturer (if applicable), Location, and Bldg./Unit (if applicable) information as these fields are used as filters to determine which equipment is available to be selected on a schedule. Once you save a piece of equipment, you can then attach or link to manuals, photos of the equipment, and equipment specs. There is a maximum of 5MB of storage for attachments per piece of equipment. You can add as many attachments as needed as long as they do not collectively total over 5MB. For files that are too large, you can attach a link to a URL instead. These attachments are also available when viewing Equipment in Work Order and Capital Forecast. On the Add/Update Equipment screen for the equipment you just saved, scroll down to the Attachments section. Add attachments to existing equipment by selecting it from the My Equipment list page. In the pop up window that appears, select the Resource Type as either a File or a Link. For a File Attachment, enter a Description of the file. Select the file from your computer to Upload and click Save. For a Link Attachment, enter a Description of the file to which you are linking. Enter the URL and click Save. Close the pop up window and the screen will refresh to show the file or link listed in the Attachments section. A paper clip icon will be visible next to equipment with attachments on all Equipment list pages. It will also appear next to the Equipment field on the WO form when a piece of equipment with attachments is selected. Click on the paper clip to view the attachments listed in a pop-up. This feature is most beneficial in manufacturing organizations where there are multiple equipment lines containing individual pieces of equipment. 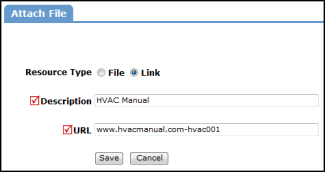 It allows you to track linked pieces of equipment that are integral to the functionality of other pieces of equipment. Scroll down to the Link Equipment section of the Add/Update Equipment screen. Click the binoculars icon next to the Link To box to select the parent equipment that the piece of equipment you are entering will link to. In the pop up window that appears, you can select the equipment from the List View or the Tree View. 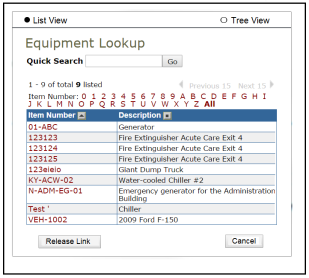 The List View allows you to search and filter your entire equipment list by item number or equipment description. The Tree View shows the existing hierarchy of your linked equipment. 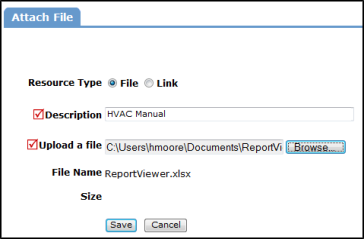 You can report on your linked equipment by running an Equipment report and selecting Linked Equipment Hierarchy as your Report Type. Once you have saved one piece of equipment, you will be able to duplicate it to create more pieces of equipment. This is extremely helpful when you are entering several pieces of equipment of the same type. Once you click Save, a Duplicate link will appear in the Shortcuts section at the top of the page and a Duplicate Record button will appear at the bottom of the equipment form. Click either of these to bring up a new equipment form. All of the information from the previous equipment record will be copied into this new form, except for the Item Number. Enter a new Item Number and make any necessary changes to the information. Once you have equipment in the system, you can begin associating them with new and existing schedules. To add equipment to a new schedule, click on the New Schedule tab and fill in Steps 1 through 6 with the appropriate information for this schedule. To add equipment to an existing schedule, click on the PM Schedules link under the Information Analysis section of the home page. Click on the Title for the schedule you would like to add equipment to and then click on Step 7. You will see a list of equipment that is available to be selected on this schedule. *Note: This list of equipment is filtered by the selections you made in Steps 2 through 6 of the schedule. The only equipment that will be listed are those that match those selections. If you do not see the equipment you need listed in Step 7, check the selections in Steps 2 through 6 and the information on the equipment form to make sure they match. Put a check in the box next to the piece(s) of equipment that will be included in this schedule. You can add more than one piece of equipment to the schedule if needed. To select all of the equipment listed, click the Select ALL Equipment button above the list. You will also need to choose whether you would like to generate one work order for each piece of selected equipment or generate one work order for all of the selected equipment collectively. If you generate one work order for each piece of equipment, the system will create a work order for every piece of equipment you have selected on the schedule. 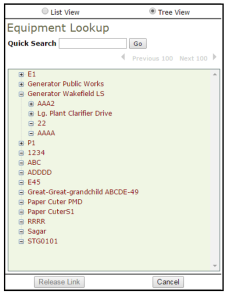 If you generate one work order for ALL equipment collectively, the system will create only one work order with all of the selected equipment listed on it. If you generate one work order for ALL selected equipment collectively, you will not be able to track the pm costs of the individual pieces of equipment. Your preference on this option may change depending on the type of asset schedule you are creating and whether tracking those costs is important to you. After making your equipment selection, click Next Step to save the information on your schedule.